The Los Angeles Times has something against the Dodgers. I knew it when I worked there, and it has only gotten worse since I’ve been gone. I don’t know if it is the plethora of Angels fans that inhabit the south end of the 3rd Floor of what, in the good old days, was known as Times Mirror Square (it even had its own ZIP code), or the fact that all the people at The Times are so miserable that they jump at the chance to point out something bad about somebody just to make their own pathetic lives seem less awful. But I know that, if the Dodgers do something spectacular — like win 22 out of 28 games with a record-setting, come-from-behind, 5-run 10th-inning hitfest — you will barely be able to find the story in the Sports section (see right). However, if after the most amazing July (and it isn’t even over yet), the Dodgers lose one little game, 5-2, to the Cincinnati Reds — probably because they were tired from flying in from Toronto at 4 in the morning — it is splashed all over the front page with a banner headline and a 5-column photo of a dejected Andre Ethier (see above). It has always been like this, at least for the past 8 years or so. 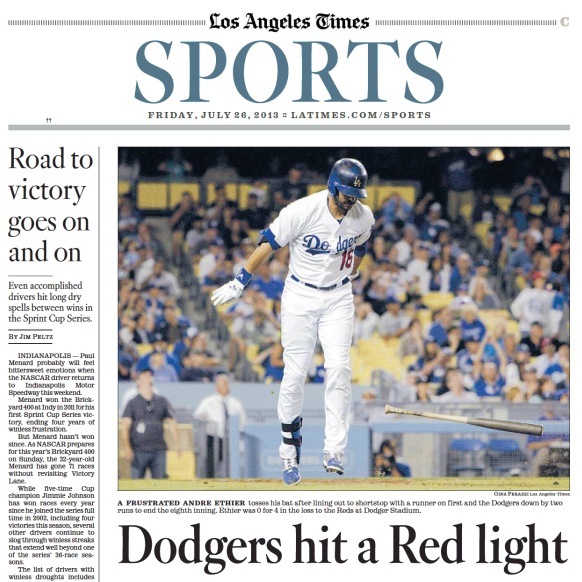 Always the Dodgers failures are blasted out in the newspaper equivalent of neon lights, while their victories — of which there have been many the past four weeks — are relegated to, maybe, a tiny, one-column story, or even just a refer to inside. I’m not making this up. In the first six games after the All-Star break, the Dodgers scored 47 runs on 78 hits. That’s an average of more than 7.8 runs on 13 hits per game. They had 10 road-game wins in a row, a record for the franchise since it moved here from Brooklyn. In other words, they hit and played their asses off, took a late plane back to L.A. and then had one bad game on too little sleep. But look at the difference in coverage. 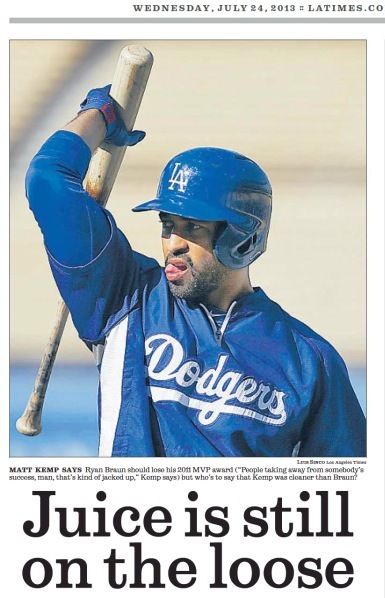 Anybody just glancing at the page would immediately jump to the conclusion that the L.A. Times is reporting that Kemp has been using performance-enhancing drugs. I think that kind of play of Plaschke’s column about Ryan Braun could be grounds for a libel suit on Kemp’s part. But that is how the Times handles anything Dodgers. Look closer, you’ll see. The Dodgers are not going to win every single game for the rest of the season. 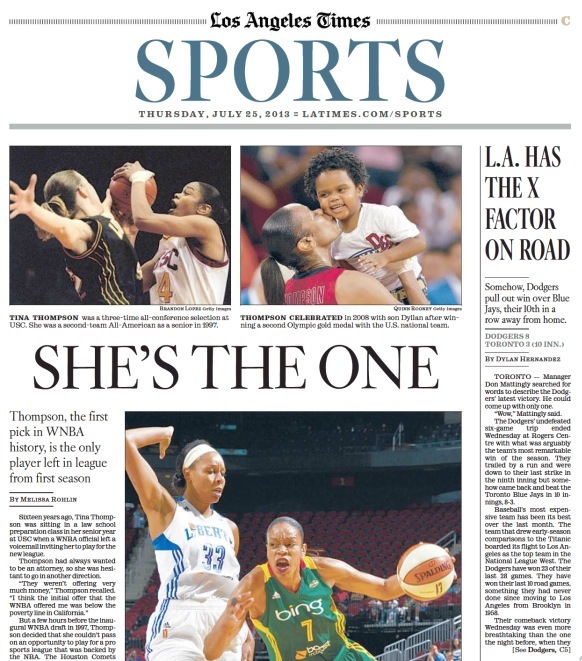 There will be a few losses thrown in for good measure, but I guarantee that L.A. Times readers will be more aware of their few setbacks than of their many triumphs.